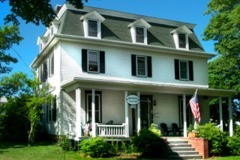 This Narragansett Pier Bed and Breakfast Inn is within walking distance of the beach, Towers, Village Inn, and other wedding venues. Perfect for wedding groups, the inn offers eight rooms with air conditioning, WIFI, off street parking, full breakfast every morning and hotel style amenities. Some rooms feature whirlpool tubs and fireplaces (seasonal) for those special get-aways. It is a no smoking property, dog guests possible.